If you have been a REALTOR for more than a week I am sure you have had to overcome the “AVM Objection” or as some call it the “Zestimate Objection” from a client or consumer. Whether Buyer or Seller, it’s a fact of real estate today – the consumers trust the Zestimate far more than we trust a real estate agent. The best way to overcome the danger of the Zestimate mystique is to better understand what an AVM is and why the RVM is your best tool to help you demonstrate why an AVM isn’t the be-all-end-all of real property valuation. I am going to attempt to keep this simple, so it’s as easy as possible for us all to embrace and master our nemesis – any AVM really, but mostly the AVM’s presented on consumer facing websites which then in turn sell advertising. I will try to explain some of the methodology behind the process, and also the “median error” or the “acceptable” margin of error that’s in the “small print” most people don’t read. The Zestimate is a form of an AVM, so to understand it lets first look at what an AVM is. AVM stands for Automated Valuation Model. It is a computer software program that combines data which is publically available such as assessed value for taxes, public records of property transfers or sales. The program calculates a value for a property based on the data collected. The use of AVMs began as a business tool to automate the process of valuing a real estate portfolio. Governmental organizations, high-volume mortgage lenders and Freddie Mac were some of the first to implement use of AVMs. This led to the consumer facing models of the AVM when media companies (such as Zillow) saw the opportunity to monetize the data, by presenting an AVM as a “fact” on consumer facing websites, intrigued consumers were more likely to take the “bait” and request more information, leading to the pay-per-lead model or advertising models that we are familiar with today. The high consumer demand that began in about 2003 to know what the “true value” of real property was led to the growth and reliance upon these consumer facing AVMs. The problem with these models is that they don’t take into account the “local” nature of real estate values or the actual condition of a property, it would not be efficient to customize the AVM for each market, so a general model – frequently based on broad top level categories like zip codes – is used with a much higher “acceptable” (to the website owner) margin of error. Timeliness: There may be a lengthy delay in public reporting of property sales and transfers. Availability: If there is a lot of data available the AVM can have a better success rate, whereas in an area with few sales or transfer, it can be incredibly inaccurate. In some non-disclosure states it is even more difficult to get an acceptable accuracy score. AVM websites know their accuracy rate is low. As an example, Zillow rates their accuracy on a 1-4 scale. The scale is tied to the Median Error for a specific geographical area. The AVM is run whether or not there is enough data to produce a reliable result. The Zillow AVM assumes average condition for all properties, to normalize the results. It is unable to take into consideration improvements, or deficiencies in a specific property. 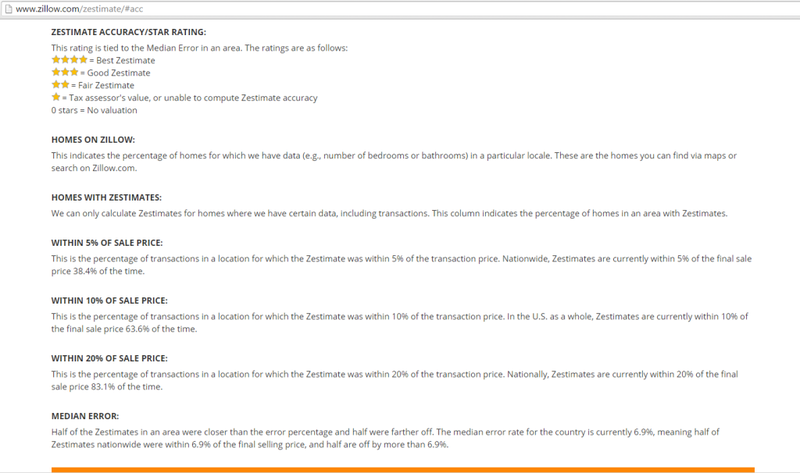 As of May 19, 2015 Zillow lists that their current Media Error is 8% but then further down the page they state it is 6.9% – to read the entire explanation you can go directly to that data on Zillow.com or I will try to briefly explain what it means. 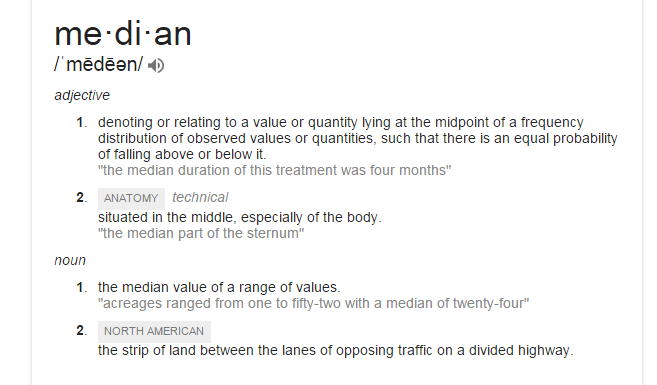 If you remember “Mean, Median and Mode” from high school math, then you will understand what Median means. Median in mathematical terms is the middle number within a particular set of numbers, this means that there are an equal amount of results before and after the median result. Without stepping into the mathematical argument of whether the median or mean is the “better” (depending on purpose) number typically when a Mean (average of the data) is calculated the Median (middle number of all available data) will be a “better” result for the desired purpose. So if you wanted to spin information to appear more accurate you might not want to go with an average, or the Mean. Whether the correct number is 8% or 6.9% that means that 50% of Zestimates on properties are within 8% or 6.9% of the final selling price of the property, and the other 50% of the Zestimates are further off (above) the indicated percentage of 8% or 6.9%. What does that mean? That means that they have a REALLY HUGE acceptable margin for error, in my opinion one that borders on inane and unacceptably inaccurate. Are consumers reading this information before they start waving the Zestimate flag? Is Zillow actively promoting their acceptable Media Error rate? Of course not. A side note, Zillow lists that they have 110 Million properties in the system, that statistics was dated in March of 2013. The National Association of REALTORS to the Rescue! I know I am not the only one who has had a hard time demonstrating why the AVM is not the definitive answer, even Zillow recommends that consumers consult a real estate professional for more detailed and accurate pricing and information, but people don’t read these days. So how can we best overcome the Zestimate objection with a more accurate AVM model and our area expertise? Quite simply with the RVM and RPR. In 2012 RPR became a dues-funded member benefit for all REALTORS. The development of the RVM was focused on creating a modern AVM model that could help REALTORS accurately identify, visualize and convey accurate and current market information and trends to use in their business. By incorporating the MLS data – which includes historic records, as well as the most current information the RVM has proven to be the most accurate AVM available. As of today, RPR is showing that it has over 129 Million parcels in the data, 1.8 Million Active Listings and 222,000 distressed properties, all ONLY available to REALTOR Members. Timeliness and Availability: The use of the real-time MLS data via strategic partnerships with MLSs ensures accuracy that has never before been available to an AVM model. Accuracy: With the RPR provided tools, REALTORS can refine an RVM to properly and accurately reflect the value of a property. By being able to make adjustments for property condition, market condition and improvements, you are then able to portray the true story of a property’s value. By using the RVM as a starting point, we are able to refine the value – make adjustments and present a powerful report – choosing from a few options. There are Sellers Reports (similar to a traditional CMA), Buyers Reports (which include Neighborhood data which is derived from sources such as The United States Census data showing a variety of demographics that are usually of high demand to your clients). So the next time someone tells you what their Zestimate is, be sure to know what the Median Error is for your area, and perhaps even print a copy of that data onto a PDF and keep it on your phone to show the consumer. With the RPR Mobile application you can pull up any property and if it has an RVM you can refine it and create a CMA as well as email it to your client all while you are in the subject property. The value of data is in the accuracy of the data, but the marketing can trump true value and lead to the “Rule of Perception” overcoming truth and creating trust. It’s a danger of the digital age. Now, hopefully, you are better equipped to handle the conversation. 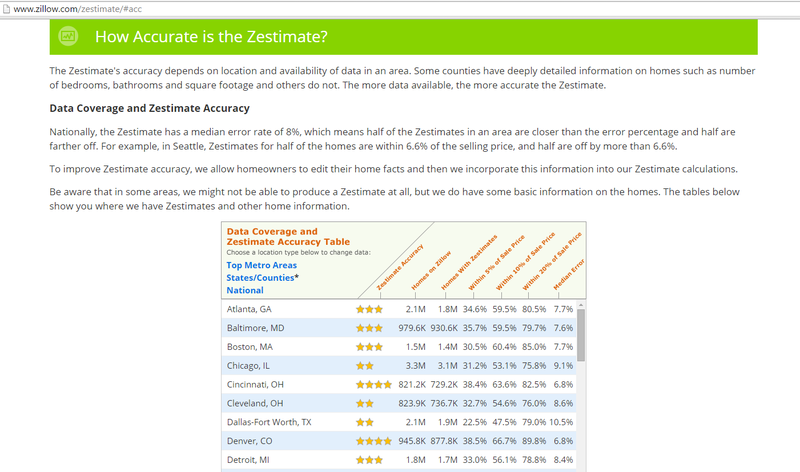 The Zestimate is a registered Trademark of Zillow Group. Source materials include The National Association of REALTORS Realtors Property Resource materials; Zillow Group. Today’s question comes from a consumer in Michigan. An AVM is an “Automated Valuation Model”. AVM’s have long existed, most frequented used in actuarial processes for lenders or lien holders of real estate. First, there are many different kinds of value to be determined, is the value “Fair Market” or is it “replacement” or another? Companies have created systems and algorithms to calculate the value of a real estate portfolio, which could be the total of loans outstanding for a large lending institution or the portfolio of individual real estate investors. Insurers also have their own methods for creating AVM’s. Today consumers are most familiar with some forms of AVM’s that are frequently available via real estate search sites – which in reality are really media companies advertising properties to attract consumers and then sell the “consumer lead” to a real estate professional who is paying the media company for the lead. That is the simplest means to explain these portal websites. The AVM models displayed are proprietary, created specifically for the purpose of that use. Data collected determines the results provided, the larger the pool of data the more likely an accurate valuation will be provided. Many models are based on geographic methodology that might not hold water in a different geographic area. Much like real estate itself, a property value in California can’t be determined in the same way that a property value in Boston might be. A zip code is a lousy means to measure a value but is frequently the main means for some of the most popular portals to provide values. Today, the most current valuations are those that use many sources for data collection. For instance the National Association of REALTORS has invested greatly in creating REALTORS Property Resource (RPR) to help REALTORS meet the needs of the consumers seeking valuations of their properties. RPR uses data only available to real estate professionals via listing services (Multiple Listing Services), loan processing services, various data aggregation, public records and more. The result, as I have tested myself, is an incredibly accurate and powerful valuation model, in this case it is called an RVM – REALTORS Valuation Model. I have been using RPR for a number of years, and for full disclosure I am a certified contract trainer for RPR. I have shared my valuations with clients, REALTORS and appraisers. I have been told numerous times by appraisal professionals that the RPR RVM is “spot on” accurate in the comps, and the values determined. Yes there is some human input in the final adjusted results, as there should be in any valuation. People are not machines, and an AVM is not for people – so looking at a portal AVM for your property, or a property you are interested in, without consulting a real estate professional, is not going to give you a realistic – nor fair – view of true value. Before you put stock in that “estimate” of a properties value, put your faith in having a real estate professional, and even a appraiser, tell you what that true value is.